Superman: Hey, guys. Need a hand? Superman: Yeah, sorry, I wanted to be there for your award, I mean Bruce Wayne's award. Robin: Me too. Kids aren't invited. Calling All Justice Leaguers! Super-Villain Alert! 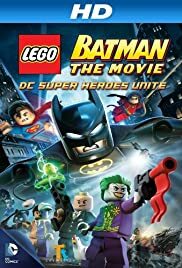 Even though LEGO Batman's story of over-the-top, superhero crime-fighting pretty much went over the same, old ground, I still enjoyed this particular CG offering a helluva lot more than I did the likes of Christopher Nolan's live-action "Dark Knight" movie-series. I really did. Besides LEGO Batman containing some often-humorous one-liners (nicely delivered by both Batman & Superman), I also got quite a delightful kick out of the LEGO-look of all the characters. From having some very amusing facial expressions, to their squat stature and stubby legs, I'm actually looking forward to checking out other LEGO movies once they become available through my city's library system. Of all the superhero characters featured in this picture's ultra-violent, fast-paced story, it was Flash, in his brief, but pivotal appearance, who I liked the most.